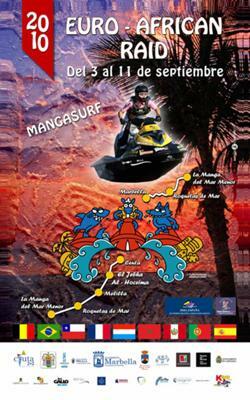 The Euro-African Raid, one of the greatest jet ski races, will pass through Marbella September 6 at approximately 2:00pm at the beach front of the Hotel Fuerte Miramar. This 8-day race covering 1000km of the Mediterranean Sea started in La Manga del Mar Meno and passes through Roquetas, Marbella, Smir, El Jebha, Al Hoceima, and Nador uniting Europe and North Africa. The last 20 pilots will be fighting for the title of European Champion of Raids (IJSBA). F3: pilots competing for two weekends of September 3 - 5 and September 10 - 11 in the stages between of La Manga del Mar Menor and Roquetas de Mar. The Euro-African Raid joins Spain and Morocco in one of the toughest and most spectacular race in the world, which includes world class riders such as Brazilian Celio Vinicius, Belgian Ente Sylvain (champion of the world of Raids), Frenchman Fred Ruffet (champion of the world of offshore), Peruvian Paloma Noceda, (current national champion of Peru), English veteran and expert in raids Russell Marmon, Spanish Juan Manuel Saez from Cartagena (current champion of Europe (IJSBA) raids), recent sub-champion of the world of raids Marco Antonio Vivanco, multi-champion of the world Carmen Ortiz, Spanish offshore champion Pedro Espadas and multi-champion of the world in free ride Alain Arrizabalaga from Basque Country as well as others.